I have a short attention span. I think I have more projects in-progress than I do actual completed projects. The projects that I have completed tend to be one-shape deals. A scarf, a baby blanket, a coffee cup cozy. As soon as extra elements such as sleeves, shaping, seaming, and especially pairs are introduced, the chances of my finishing the project drop dramatically. However, I’ve decided to take a stand and start taking care of those un-finished objects (or UFOs in yarn-speak) and get them done, if only to free up some of the needles they’re resting on. And so far so good! I think it’s a promising sign that my knitting is getting more proficient because finishing my projects seems to be taking much less time than I anticipated. Last February I knit a cozy orange neck-warmer and wanted to make arm-warmers to go with it. I completed the first one, but lost motivation to finish the second. Well, I picked it up the other night and was amazed that I was able to finish the second arm-warmer during a few episodes of 30 Rock. 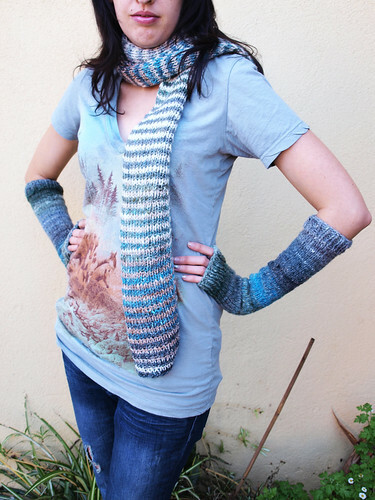 That wasn’t so bad… and now I have a cozy neck and arm-warming combo to wear just as the weather is getting more nippy! Emboldened, I dared to face a project from my very distant past. Almost 2 years, to be exact. That’s right… my first sock. I was so proud to have finished the first one, but also traumatized and I couldn’t bear the thought of repeating the experience. 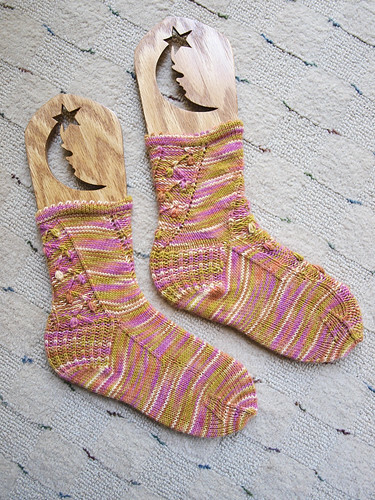 I even dabbled in other sock-knitting, but as I mentioned in my last entry, socks are just not for me. But that one single sock has been a spot of bother in the back of my mind for the past 2 years now and I decided I wanted to be done with it once and for all! My poor neglected first sock and the accompanying ball of yarn were buried in a basket and somehow coated in dog hair. I spent a good amount of time picking these hairs off as I contemplated my mission. Then I began, feeling somewhat reluctant, like it was a chore. But then, something funny began to happen. I began to enjoy myself. 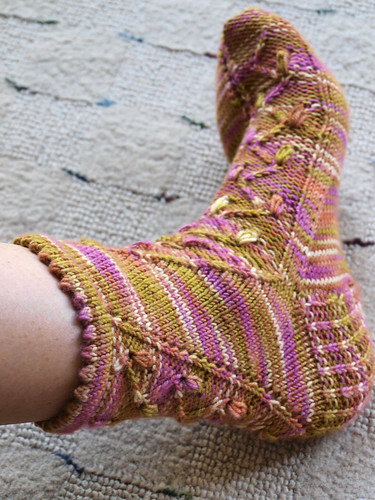 The sock seemed to fly off my needles (it is worsted weight yarn on size 6 needles, after all), and it seemed like I was done in no time at all. And even though the socks were made of basic acrylic yarn – nothing fancy, when I slipped them on my feet (which are perpetually cold, by the way), I experienced a sudden blissful feeling of “Aaaahhhh”. I’m wearing them now as I write this and my feet feel so cozy. I’m usually always barefoot in the house – I don’t like wearing socks indoors…but I’m changing my mind! In fact, I’ve decided to give socks another try. I’m now working on a “real” pair of socks using real sock-yarn and tiny needles for my husband’s huge feet. I’m almost done with the first. 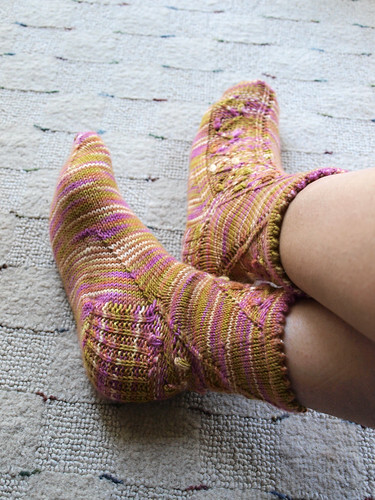 If I can finish the pair I’ll know I have beaten my second-sock-syndrome for good! It isn’t just knitting projects I’ve been finishing. I also weaved in ends and embelleshed three market bags that I made for my aunts for Christmas. I’m feeling quite good about getting all these things out of my way! I still have projects left though. The main one that’s bugging me is the second Beer Glove to match the first I made for my husband. I learned that if there is something I like less than socks, it’s making individual finger holes. But the first turned out fairly well and I would really like to get the second one over with. That’s next on my list. Next, is my Avalon Hoodie. I fell in love with the image in the magazine and I really should have held out for the kind of yarn shown in the magazine (Lorna’s Laces Swirl in Pewter)…..
…BUT… I was impatient and bought what was immedietly available at my LYS, (Lorna’s Laces Swirl in Black Purl). Now, don’t get me wrong. I like the color – it reminds me of my favorite time of day – dusk. But I’m not sure I like it on me. I very rarely wear purple and as I’ve been working on the hoodie (I’ve got the body done, just need to finish the sleeves and hood), I’m not sure I’m digging the stripey effect of the yarn. I’m having a hard time seeing myself wearing this, and from trying it on so far I fear the bottom edge isn’t as long as I would like so I’m already wondering if there’s a way to knit from the cast-on edge to make it longer… As if that weren’t enough, the LYS only had 5 balls of the yarn, not 8 like the pattern called for. But I was too impatient to worry about it (else I would have ordered the color I really wanted and waited for it to come in), so I bought the 5 that were available and knit until they were almost gone and ordered 3 more online. And, of course, the dye lot is different. Luckily it seems very similar, if not for the annoying shades of pink in the new lot of yarn that were absent in the first skeins. Sigh…As a result of all these annoyances I haven’t been working on the hoodie much of late, which is a shame because I do have so much of it done and that yarn was not cheap!! So that will be next after the Beer Gloves. So I basically got yarn-envy and ripped out all my blocks in brown and orange and god-knows-what-other-random-pukey-color and ran out and bought a bunch of puple Lion Brand yarn and started over. And I got like 6 blocks done! But…..then I sort of lost interest and I currently have a bag full of blocks and heaps of yarn that I bought in desperation. I think that’s all of my UFOs…though I’m sure if I went digging I would find one or two more. I’ll try to pretend that isn’t the case while I get my current list tackled. I’m already forming a resolution for next year and that’s that I will not start a new project unless I finish another one first! We’ll see how long that lasts!